Finding the right venue is hard work- because in Noosa there are so many options to consider. Whether you be looking for water views, sophistication or garden Noosa has an option for all couples. Now its not just about picking the perfect venue, there are other things to consider to- ease for your guests, access, available dates, ceremony options, wet weather back ups and the list goes on. We would like to share this little gem of a venue which pretty much has it all, a unique venue with great views, awesome food, close proximity to accommodation & is a perfect wet weather option for your ceremony should it decide to rain on your wedding day. 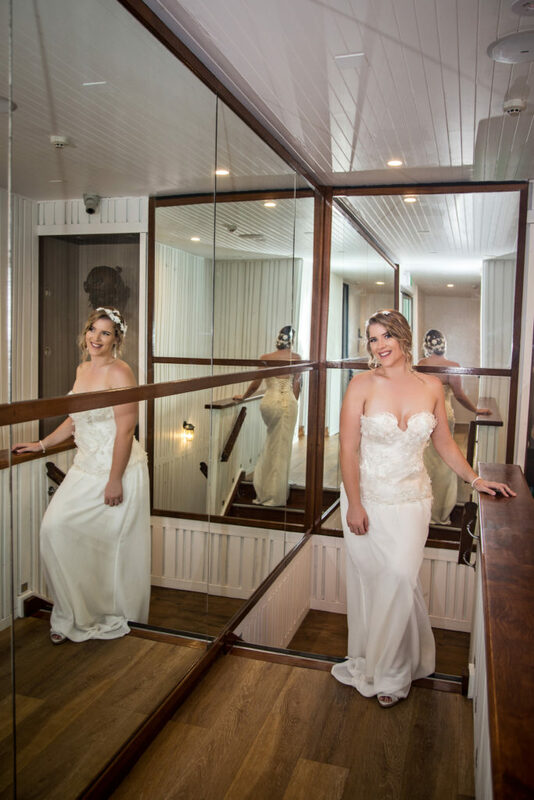 Located on the stunning Noosa River and boasting spectacular water views and amazing sunsets, Noosa Boathouse offers a truly unique setting for your Noosa wedding. Cross the fairy-light lined boardwalk and you have three waterfront wedding spaces available to choose from. Their private jetty even allows you direct access by boat to the venue, how's that for unique. This venue is also a perfect wet weather back up, imagine getting married literally floating on water, while the rain outside creates an oasis of beauty around you. If you want an outdoor ceremony, Noosa River also offers many stunning riverside ceremony locations such as Chaplin Park, Quota Park & Eli Park. I know that Kath Tilly one of our local celebrants loves doing ceremonies along the river. Kath Tilly is part of a new generation of contemporary professional wedding celebrants that love to do things that little bit different. 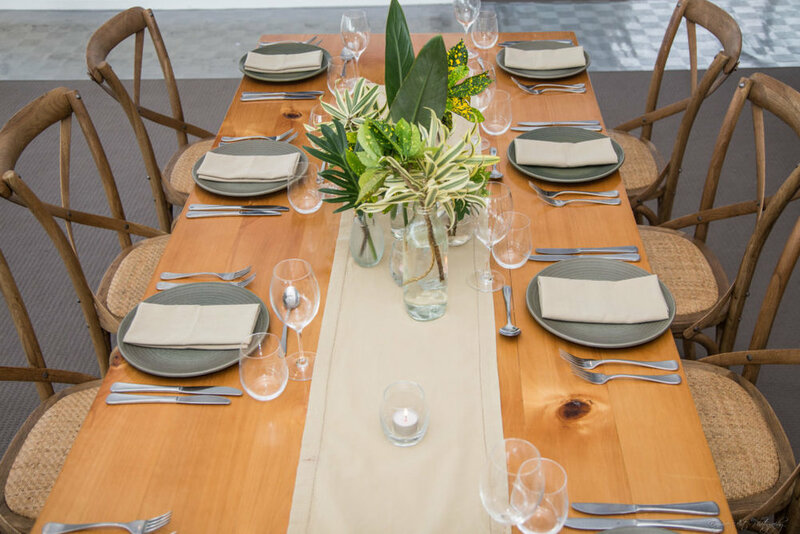 When designing ceremonies she likes to enjoy mixing a bit of tradition with some modern and fun personal twists. Think rose petal cannons, polaroid pictures & love- need I say more. Getting around in Noosa- even though accommodation is ripe around Noosaville, if you want beach photos for your wedding your going to need transport to the beach. Noosa Woody is an iconic vehicle & is the epitome of coastal class and gets everyone dreaming of this incredible tropical paradise we call home. Noosa Woody has been meticulously restored and maintained and looks sooooooo good in photos. I am really loving all the tropical wedding styling at the moment, flat colours, wood, greenery & candles. 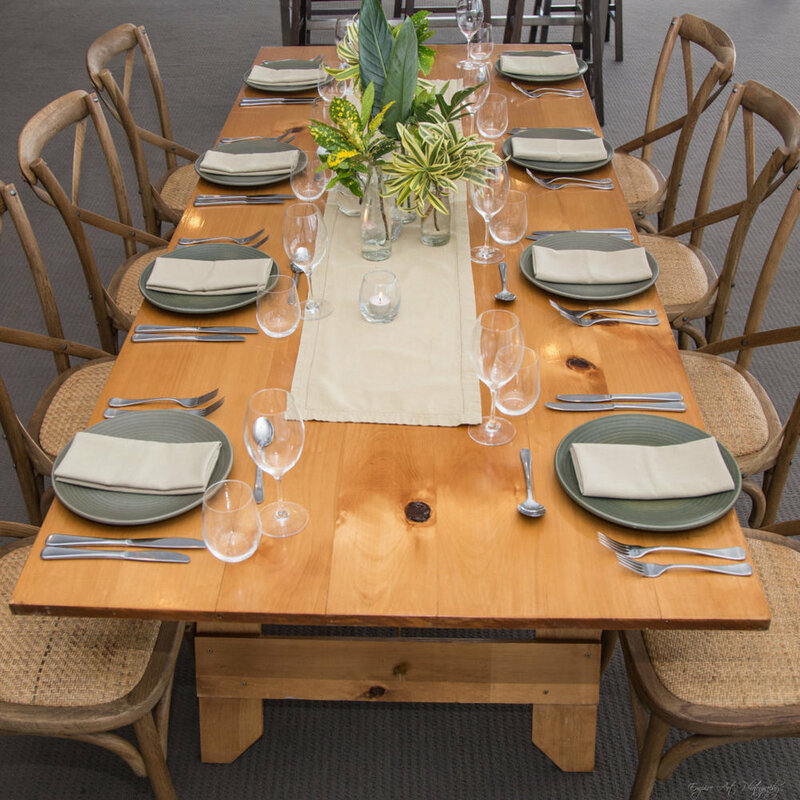 First Class Functions has created a stunning tropical oasis at Noosa Boathouse. Perfectly complimented with a stunning cake from SweetP Cakes & Cookies, Ellana draws inspirations from art, colour texture and taste. SweetP Cakes and Cookies offers a complete customized service to ensure your sweet treats are as individual as your event - I think Ellana met the brief for this stunning cake perfectly.